You may remember Ember. She was a stray dog found in Manatee County and she’s lived in a shelter for two and a half years. But now she has a new home. 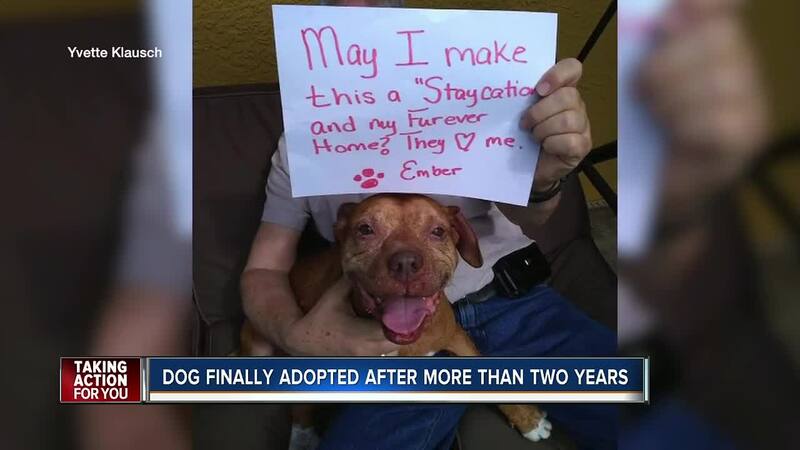 SPRING HILL, Fla. — Ember was a stray dog found in Manatee County and she’s lived in a shelter for two and a half years. But now she has a new home. "No animal should have to be in a shelter for two and a half years," said animal lover Yvette Klausch. Ember was picked up as a stray in 2016, and had been at Manatee County Animal Services ever since. Despite their attempts to get her adopted, no one seemed to want Ember. That was until Yvette Klausch saw Ember’s story on a Facebook post. "I always tell Jim (husband), let's just go look," said Klausch. They brought Ember home to Spring Hill to see if she would get along with their three adopted dogs and four cats, and they fell in love. Ember quickly made herself part of the family and now has a forever home. She even gets to go to the office with Yvette. "The whole point of this is to adopt," said Klausch.